As seen on ROMM Website! Our two-day course helps couples prepare for a romantic marriage of a lifetime. Learn about the essential foundation for a stable relationship as our course engages you in a variety of meaningful and fun-filled activities for your partner and you. 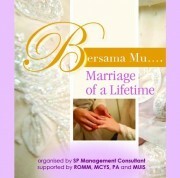 Supported by ROMM, MSF, PA and MUIS. With regard to anger, Imam Al-Ghazali says that it is acceptable only at the right time, in the right place, for the right reasons, and with the right intensity.